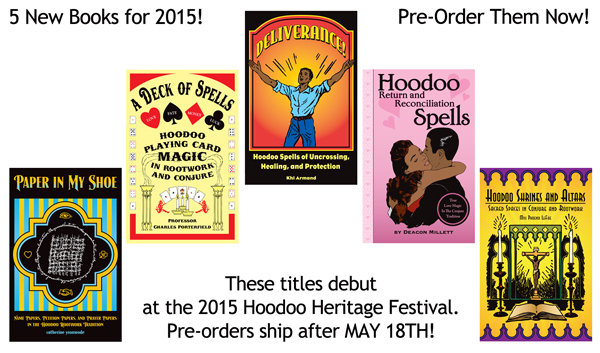 Planning is underway for the 2015 Hoodoo Heritage Festival. Updates will be revealed as plans are finalized. Our first planning session took place on October 21st. A group of church deacons, Lucky Mojo staff members, and HHF Volunteers Michael Bautista and Tiffany Bleiler started the process of logistics, presenter line-ups, food service, and even planning the contents of the goody bags distributed to participants, and more! Passes will be available for the full weekend event or just Saturday or just Sunday. There are going to be some new books released for the festival and in upcoming newsletters we will have lots of fun and information to share. Every year YIPPIE (the Yronwode Institution for the Preservation and Popularization of Indigenous Ethnomagicology) holds a fund-raiser book sale at the Hoodoo Heritage Festival. This sale offers you the chance to pick up very reasonably priced used books, pamphlets, CDs, and DVDs on occultism, divination, magic, religion, philosophy, and spirituality. We are putting out a call for you to send some donations to this event and help support YIPPIE. You can mail books to YIPPIE in c/o Lucky Mojo, drop them off in the YIPPIE office next door to the Lucky Mojo shop, or bring them by the weekend of the Hoodoo Heritage Festival and plop them down on the YIPPIE Book Sale tables. New This Year: For the first time, we are also planning a Crystal Silence League table where you can pick up information on the origins of the Crystal Silence League and ways for you to get involved, as well as purchase books and crystals. Hooray I see the page for the workshop ticket sales!!! Super excited and hopeful to see you all there! I will drive from Los Angeles to the Heritage festival. I am soooooo excited as this will be my first time !! If anyone wants to join me to split the gas money and the driving please pm me. If folks go to the page and click to schedule a reading, you will see who is available and when. http://HoodooHeritageFestival.com is the web page for program and tickets. http://bookeo.com/hoodoopsychics is the web page for live, on-site readings. Hi there! Anyone driving from San Francisco to Forestville on the morning of Sunday the 17th? I've got my heart set on attending at least one day of the festival, but haven't figured out the travel situation yet. Thanks!! Sorry no one has relied to you here abut a ride to the Festival. Do ask on Facebook as well. Thanks, I hope I can make it too! Any ideas for reaching out for someone who isn't on Facebook? P.S. I LOVE and listen to all the Lucky Mojo shows and have been sharing them, too. Such a wealth of everything!! Well, the 2015 Hoodoo Heritage Festival is over -- and it was a wonderful success. Thank you to everyone who worked the venue, presented workshops, attended the festivities, and ran the trains! Checking out Charles Porterfield's Facebook page I saw that Shaun Laveau has posted a youtube video (by Alan Scott) on his Facebook page of the 2015 Hoodoo Heritage Festival Opening Ceremony : https://m.youtube.com/watch?v=vq_WhDroVWg . You can also just search 2015 Hoodoo Heritage on youtube and it comes right up.